I was originally about to walk out of my house without this hat on. As I was leaving, I decided I needed an extra accessory. Normal, before I leave I see what I can take off as not to be overly accessorized but today was different. The hat was essential and I am so glad I put it on and ran out the door. Also excited to share my newest shoe purchase. Kind of in love with these Chanel espadrilles. Shop below for some more budget friendly versions of this black leather staple. Emily - Cool! Love the look of the sneaker espadrilles with the feminine dress. It’s a great dressy/casual mix! I’m a new reader — love your blog! Natali - Fabulous shoes and sunnies! Emma Fox - Love the shoes! I wanted the Chanel Espadrilles for forever now but couldn’t find them anywhere, love all the other options though – also really loving Rebeca Minkoff’s studded version. nikki - love that dress! seems perfect for spring! Fashion Musings Diary - Perfect look in every detail! M A R T A - such a wonderful combination, you look fantastic! Belen Baquerizo - love the hat with the shoes! beautiful. riris - one of my friend are addicted with leopard pattern, she’s gonna love it and me too, love your leopard. Really awesome..
Sasa Rakovec - Great dress! Roos - Great look, I really love those shoes! 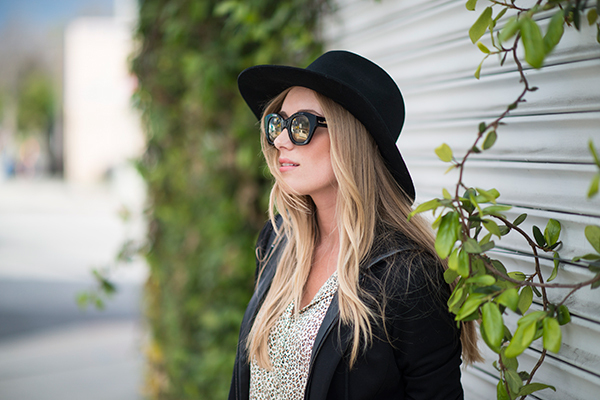 Courtney - Great outfit, I love your sunglasses! Marion - Your shoes are so cute! Love your pics! Carsla - Stunning shads! Loving your shoes with this outfit! Smart. (: Looking forward to your future posts.